"Saatchi & Saatchi were appointed to help with the task of retuning around 3 million VCR's. Channel 5 had to visit ten million homes to check all households which could be affected. 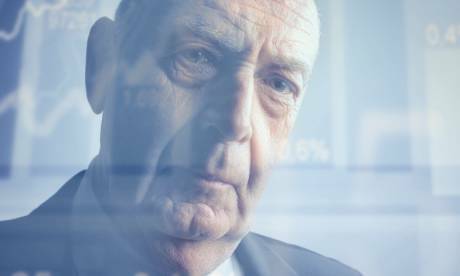 The retuning campaign cost £5million, with Saatchis responsible for through-the-line advertising. " As I recall we didn't put in a sensible bid because there was excessive worry about having so many visits to people's homes: it was a easy route for con-men to find their way into vulnerable people's homes. But .. when a home was visited, if anything was done, and most often it wasn't , then it was a 10 second job with a screwdriver. It doesn't really compare with setting up a whole new subscription system, sourcing TWO BILLION POUNDS of hardware to fit into people homes. And that's before you remember that people use Freeview on second sets when they have Sky as their primary in 6.2m more homes. Most homes have more than one Freeview TV when they have Freeview. The hardware costs are just the start of it, if you need to do home installs, they are not cheap. I don't know if you've notice but The Treasury is rather strapped for cash at the moment, and it would be an illegal use of Lottery funds. I don't think a comparison with Freeview implementation rate is valid. The engineering task of changing, modifying and adding transmitters, while maintaining the existing analogue system, was a complicated one, and the speed with which it was performed was (partially) controlled by cost and availability of suitable engineers to carry out the work. 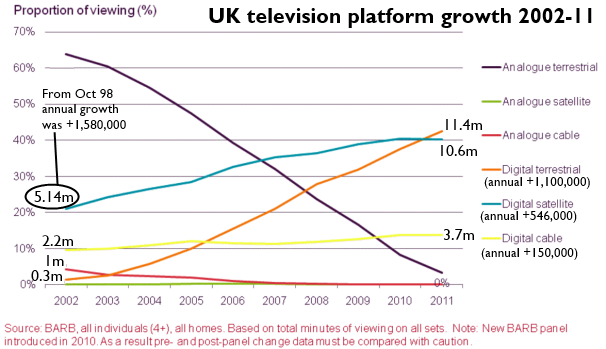 The long drawn-out period over which Freeview was implemented across the country obviously affected the Freeview take-up rate. By comparison, the engineering task of modifying and adding encryption equipment, while maintaining the existing system is trivial - the encryption could be operated in clear on the existing channels until BE-Day (Beeb Encryption Day). So the transmitter engineering would, probably, not be a limiting factor in the Beebbox take-up rate. R Shead: Of course doing the encryption is trivial. There are two channels already encrypted on Freeview (BT Sport 1 and 2), but only 1% of viewing equipment can decode them. So... the ten million new set-top boxes and PVRs. How is that done "overnight"? All existing Freeview boxes and TV sets have no capacity for decryption. And.. who exactly paids for the two billion pounds (or more) of new hardware? How does that get shipped? What is the supply chain? A system that encrypts a signal that no-one can de-crypt isn't likely to prove a popular proposition. 1) Main set, LCD flat screen, built in DVB-T. Standard set has no CAM slot. User would require a set-top box and viewing card. 2) Main set, LCD flatscreen, built in DVB-T2. User would require new set-top box and viewing card, connection via HDMI. 3) User has Sky subscription services on the main set, but the household has three other TV sets that use Freeview. Each would require new set-top box with viewing card. 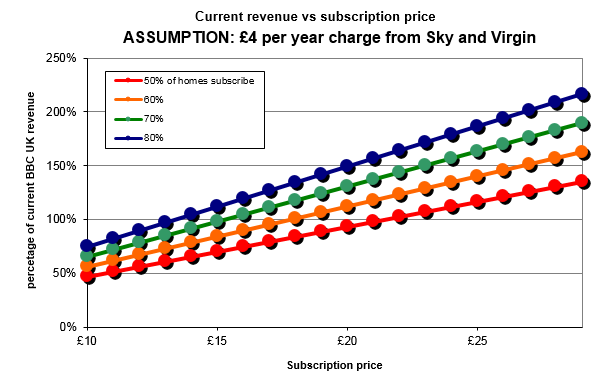 Issue with household having paid Sky for BBC subscription, shouldn't have to pay again to watch on DTT pay. 4) User has a YouView box on the TV. This will need to be replaced as YouView has not card slot. Viewing card etc. 5) Home uses Freesat. No subscription services, so this hardware will need to be replaced and user handed over to Sky subscription services. 6) Small family hotel has TVs in each guest room. Each TV will need to be replaced with a new set that can take a viewing card (and physically lock the card down). 7) Family home has several TVs, one in the "granny flat". Each would need to have a set-top box added. 8) Home containing a vulnerable user (poor eyesight or mobility), has special Freeview equipment fitted. This will need to be junked and changed for a subscription option. and so on... it's not "trivial" when there are ten million homes like this. It's also worth noting that Sky's encryption system, the one supplied by NDS, has a "return path", in that the box uses an 0800 number to "call home" overnight. This has made the system very secure and kept fraud almost non-existent. However it does mean that you are required (for the first 12 months) to have your Sky box connected to a phone line. The system used by ONdigital (aka ITV Digital) was hacked before the boxes were shipped out, by comparison. It's not much of a subscription system if it can easily be broken. Today, you could probably scrap the viewing cards and use the Internet for authorization and security. But does EVERY DTT home have the internet? There are other scenarios, such as main TV has no Freeview built in but STBs used for Sky and/or Freeview. Many who still like to watch on their TV set they had before Freeview started (often CRT types) and still works well enough for them will have obtained STBs rather than change the TV set. Flat panel TVs were quite expensive back then but have come down in price significantly since, but many work on 'if it isn't broke, don't fix it' so still have the benefits (?) of a CRT. On the use of the internet for controlling authorisation (note the UK spelling please) is fraught with problems as well as many older people do not have an internet service, they see no benefit to them so don''t pay the extra for something they don't use. With no internet, no authorisation. Plus not everyone has WiFi in the home nor an Ethernet point somewhere near enough to the TV to connect that way. Some, but not all, new homes are having Ethernet cabling included but builders often assume WiFi will be the 'default' in homes. When refurbishing our lounge, I went to the lengths of installing two satellite points fed from two of the four LNB outputs (the other two feed into the conservatory for summer viewing), a down and up link in CT100 for terrestrial signals, a phone point, an Ethernet point plus two twin-gang mains sockets. They ar all grouped together in a corner behind our TV equipment, so largely out of sight. I'm able to do all of that work because of my experience and certification, but most non-DIYers do not have the required knowledge perhaps and few will have the certification needed for the mains work. The phone and Ethernet is not something many consider doing, or having done, despite how useful it is. MikeP: I'll come back to that in a moment. but I always go with the Oxford English Dictionary which goes for the "z" spellings: authorization: definition of authorization in Oxford dictionary (British & World English) ! MikeP: I agree, there are lots of other possibilities. Certainly there are lots of sets out there without digital (DVB-T) tuners built in where a set-top box (standard or PVR) is used. It just seems a bit odd to me that some people seem to be of the opinion that the BBC channels can be encrypted and not realise that an encrypted service needs a DECRYPTION end too. Anyway, there are over 10 million homes with "Freeview only" , and all the stats suggest that these people probably have, on average, two TVs. As far as "the internet" is concerned: yes there are people without it. The best I can come up with (as dial-up is 100% dead) is to include a small 3G device in the box to get a connection that way, if there isn't a wifi or ethernet (even - urgh - powerline) available. Given that the data needed to do an authorization would be trivial, a few packets here and there, using IP rather than post+smartcard is a good proposition. Also, you might as well provide iPlayer with the box. Whatever Andrew Bridgen, MP most genuine concern for "155,000 people were convicted of not having a TV licence", it means for every one of them, 188 Freeview boxes are going to end up on the scrap-heap! Briantist: I think we can sum up the technical problem as getting a device which uses ethernet/wifi (now standard on most TV from 2013), plus possibly 3G (for those who dont have that, although what about 3G coverage?) for encryption, plus outputs for RF, Scart, RCA (why not?) and HDMI. It should probably be preloaded with Iplayer/BBC News/BBC Website. And, God help us, a card slot for those who having nothing at all to communicate with the world at large. Thats doable. In fact thats largely a streaming device with a digibox. Thats not the problem. The problem is getting them in tens of millions of homes, whose going to pay for them, perhaps install them, and the costs of keeping it secure, functioning and up to date. And of course getting people to put yet another box by their TV. When you think about it, to please the ideological whims of a tiny number of people who have a TV, but choose not to pay the licence fee, or an even smaller number of people who have a TV, and apparently are convinced that they (or anyone in their household) never use the BBC, this is daft. Its totally and utterly insane on any practical level. Its an ideological problem (plus a fair amount of self interest from certain media rivals) thats driving this. Its a mixture of dappy techo optimism ('if Sky and Virgin can do it, why not the BBC? '), vandalism of a great institution, and total ignorance of reality. Truely, as in so many things, we live in 'The Age of Stupid'. I have been following this thread with interest and bemusement. Most of the scenarios outlined are too complex, too expensive, too selective, in sum too unrealistic to merit serious consideration. The concern remains that abacus-operators in government and commerce may nevertheless devise a scheme which is to their advantage - but not to that of the majority of viewers.